Shelby, Emily, Lindsey, Callie and Abigayle, fifth graders at Chelsea Intermediate School and members of Girl Scout Troop 597, recently earned the Girl Scout Bronze Award for their project Go Green with Girl Power. The girls helped other troops earn their Forever Green patch as they led their service unit weekend by teaching other Girl Scout troops how to recycle. All of the activities took place outside without electricity. They played a recycling game and water bottle tag, and they made crafts using recycled materials. 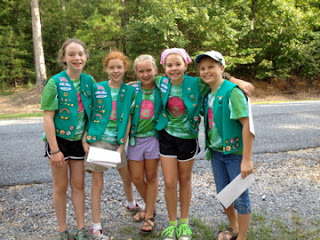 The Girl Scout Bronze Award is the highest award a Girl Scout Junior (fourth and fifth grades) can earn. This award recognizes that a Girl Scout Junior has gained the leadership and planning skills required to follow through with a project that makes a positive difference in her community.